Missing that present that will make your special little one say “WOW!”? We’ve got “last minute” specials on a variety of great items. Come in the store for 20% off a variety of items including the Alex Super Art Table, Guidecraft Spindle Toy Chest, and Fitness Fun “My Treadmill”. Don’t miss these great deals! We’ve got 1 Force Trainer left! Need a unique gift? Know someone who loves Star Wars? The new Force Trainer is the perfect present! 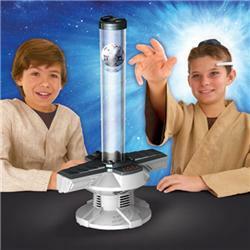 It reads your brainwaves, allowing you to control a Jedi Training Remote with your mind. The deeper your concentration and mental focus, the greater your ability to move the Training Sphere up or down the Training Tower. Posted in Uncategorized. Comments Off on We’ve got 1 Force Trainer left! Ehren solved the very difficult 36 Cube puzzle from ThinkFun! In order to solve the 36 Cube, you must place the towers so that they are all even and no color is repeated in any row or column. This puzzle makes a great gift for those “big kids” who are so hard to buy for. Are you ready? We’ve got lots of Hanukkah books, novelties, and stuffed animals. We even have a wooden Hanukkah set for your little one to play and learn with! Posted in Uncategorized. Comments Off on It’s almost Hanukkah!